Brimham Rocks is a beautiful National Trust site in the Yorkshire Dales, not far from Harrogate. 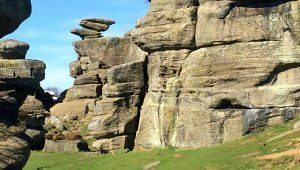 The rock formations on Brimham Moor have weathered over the years into all kinds of impressive shapes, with many rocks left ‘balancing’ on top of others. There are many paths around the site, leading from the car park to the National Trust shop, however don’t feel you have to stick to them. We found the more interesting formations didn’t have a path to them. Climbing of the rocks is not discouraged, although you will need proper gear for some of them. Other activities here include cycling, photography and wildlife watching. We loved this place and you can easy spend quite some time here soaking up the views and jumping off rocks. Bring a picnic and climb a rock for terrific views all around while you eat your sandwiches. Alternatively, there is a National Trust kiosk here that sells drinks and snacks. We visited on a sunny Friday in late March though and it wasn’t open! The kiosk is generally open on weekends in the winter and every day in the summer. The shop here also has limited opening times out of season. Parking is plentiful, but expensive at £6 (2017 prices) and you will need the right change. If you are a member of the National Trust it’s free however.